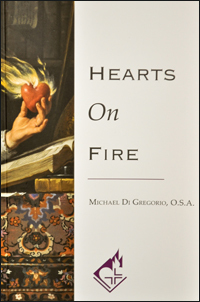 The cover of “Hearts on Fire” by Michael DiGregorio, O.S.A., published by Augustinian Press. How many members of the Augustinian Order have become saints over the centuries? Probably there are many thousands if you define a saint as a person who has lived a reasonably good life and has now gone to heaven. If you are just including those who have been officially canonized by the Roman Catholic Church or have causes for canonization in progress, it is more like 100 including “and companions,” martyrs listed with named martyrs. In a newly released book, “Hearts on Fire” by Augustinian Father Michael DiGregorio (Augustinian Press, $15), there are short biographies of these canonized saints and saints in waiting. It is actually an update with amendments and additions of the earlier “Book of Augustinian Saints,” now out of print, by John Rotelle, O.S.A. Most of the entries are arranged by feast day date for those who follow the Liturgy of the Hours. 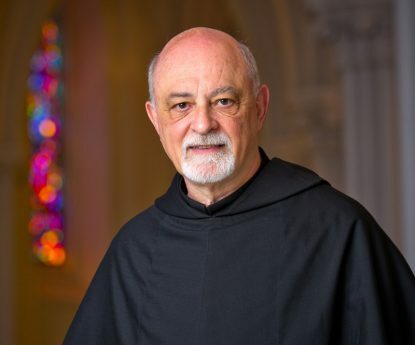 These saints could be an inspiration for any Catholic, according to Father DiGregorio, who is currently provincial for the St. Thomas of Villanova Augustinian Province covering the Eastern United States and missions in Japan and Peru. However, his main purpose in writing the book was to give his fellow Augustinians role models of past examples of what Augustinians aspire to be. Not all of the saints listed were actually Augustinians for the simple reason St. Augustine of Hippo (354-430), for whom the order is named, did not establish it. One of the most important doctors of the church, he did write a rule for monasteries he established, which could be adopted by others. He was born in what is now Algeria, then part of the Roman Empire. Although his mother St. Monica was very spiritual, Augustine in his early years was not and he led a fairly hedonistic life. He was not baptized until he was 33. After that he hit the ground running, ultimately becoming Bishop of Hippo, an office he held for 35 years until his death in the year 430. St. Monica never had an official connection to the Augustinian charism, but she too is venerated as an Augustinian saint. “I like to say Augustine became a saint through the prayers of his mother, and Monica became a saint through the agony her son put her through,” Father DiGregorio said. Other early Augustinian saints were friends of Augustine or near contemporaries who modeled their own lives after his. This would include St. Fulgentius, St. Posidius and St. Liberatus, among others listed by Father DiGregorio. Coming forward to 1243 a group of monasteries in Tuscany petitioned Pope Innocent IV for permission to join together as one order. He granted this permission but required them to follow the Rule of St. Augustine. Twelve years later Pope Alexander IV issued a bull requiring many others to join what would become the Hermits of St. Augustine. There are saints and blesseds from the 13th century and those that immediately followed. Mostly they are from Italy and Spain but it isn’t just men. There are St. Rita of Cascia, Blessed Julia of Certaldo and Blessed St. Clare of the Cross, just to name a few. There is even a brother and sister team, Blessed John of Rieti and Blessed Lucy Bufalari who both joined branches of the Augustinians in the 14th century. If Father DiGregorio has a personal favorite it might be Blessed Stephen Bellesini (1774-1840) whose career was preaching and teaching but especially care for the poor and the sick. He died in 1840 from typhoid fever, which he caught while ministering to victims of that deadly disease. Some of the most dramatic examples of Augustinian saints and blesseds are martyrs — holy men and women, either Augustinians or people they ministered to. This was especially so in Japan where some of the luckier ones were simply beheaded. Others like St. Magdalene of Nagasaki were exposed to long periods of unspeakable torture. One might say being thrown to the lions would be euthanasia by comparison. The process of someone to be declared a saint in modern times is usually long and complicated. In four steps it is rather like baseball: first base, second base, third base and home. First base would be when a local diocese opens a cause for a holy person who is then called “a Servant of God.” Second base would be when that cause is officially accepted by the Vatican as worthy of consideration, leading to the title Venerable. Third base happens when a miracle is accepted as having occurred through the intercession of the candidate. He or she is then beatified and has the title Blessed. Home plate is after a second miracle has been accepted and the holy man or woman is officially declared a saint, or canonized. However, the pope can and on occasion does skip some of the steps if the cause is so obvious. In many if not most cases the cause never advances to official sainthood. “Hearts on Fire” has in it far more holy men and women who are Blessed, that is, beatified but not canonized as saints. Others are Venerable or Servants of God. Two of these are of local interest. Servant of God John McNiff (1905-1993) was born in Media, Delaware County, Pa. He entered the Augustinians in 1923 and spent most of his long career as a missionary in the Philippines, Cuba and Peru. His cause was opened in Peru. Servant of God William Atkinson (1946-2006) was born in Philadelphia and entered the Augustinians in 1964. Although almost completely paralyzed the following year in a tobogganing accident, he continued his studies and with special dispensation was ordained a priest in 1974. Despite his disabilities he taught at Monsignor Bonner High School for the next 30 years and was noted an excellent teacher and compassionate confessor. His cause for canonization was formally opened by the Archdiocese of Philadelphia in 2015. “Hearts on Fire” is available for purchase on the Augustinians’ website, here. For bulk copies send an email message to communications@augustinian.org.